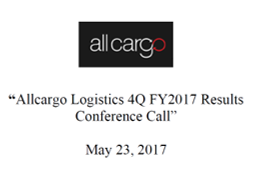 Despite the slow growth in global macroeconomic situation, AllCargo has shown growth in volumes by about 13% y-o-y. Last quarter the freight rate growth has been the best and the fastest since 2010. Going forward it is believe that the freight rate shall hold well, even though the capacity remains constant or grows marginally. The company has a very strong presence in pharma, auto and chemicals and a fast growing penetration in the fashion and retail space. ROCE improvement drive is being continued. Low yielding assets without strategic importance are being sold. 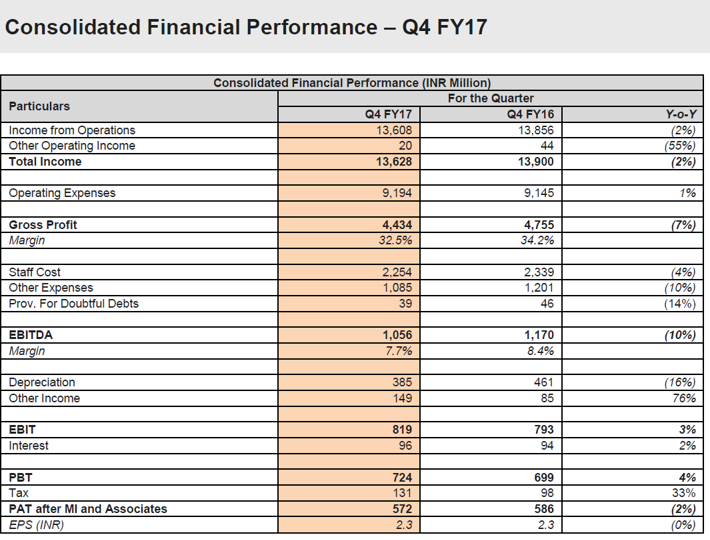 Have performed better than the global LCL trade, which grew by around 2% to 3%, the company is planning to continue to outgrow the market. Revenue during the quarter stands at 1,161 Cr y-o-y, decrease of about 2% mainly on account of change in currency fluctuation and transfer of the freight forwarding business to ACCI. The return on capital employed is around 29%. The freight rates are strengthening, they are moving across the trade length. Marginal growth in margins is expected. Allcargo is in the top three as far as CFS business are concerned across India. Approvals are awaited for the CFS in Kolkata to commence operations. Volumes have grown by 15% y-o-y to 77,021 TEUs for the quarter and 8% y-o-y for the full year at 291,186. Volumes of ICD’s in Dadri and Kheda for the quarter have grown by 2% year-on-year to 8,170 TEUs. The full year volume for ICDs in Dadri and Kheda was 35,670, a y-o-y growth of 17%. 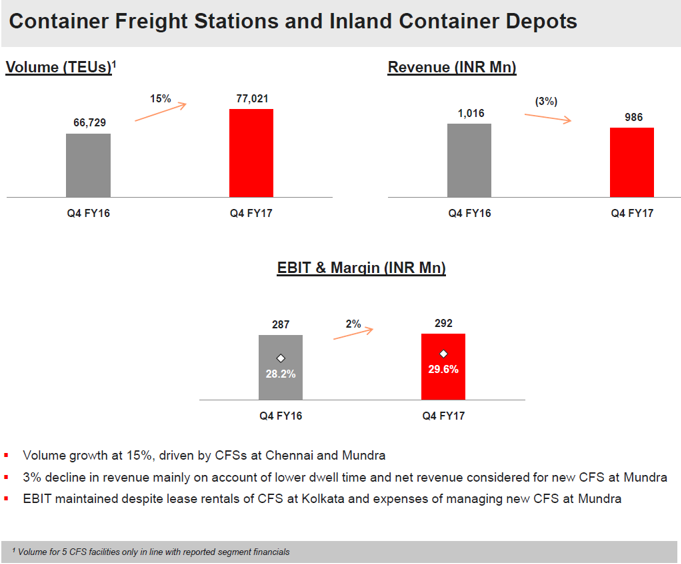 EBIT for the quarter has been maintained at Rs.29 Cr despite lease rentals of the CFS at Kolkata and expenses of managing the new CFS in Mundra. The revenue from CFS and ICD’s for the quarter was at Rs.114 Crores a decline of 10%. Business is expected to pick up traction once the government and private sector spending starts to accelerate. Direct Port Delivery (DPD), which was initiated in the third quarter of the last financial year with a focus of ease of doing business, has changed the CFS service offering. This has negatively impacted a traditional CFS but has created a new segment for value added services for end-to-end logistics. A better solution is offered by providing storage facility at the port itself. Transportation, handling and also the ground rent is collected as part of the complete service. Post GST implementation the potential in this business is really very high keeping in mind the existing customers requirement, their planning in terms of inventory movement, warehousing and other thing wherein the company contributes a lot in terms of assisting them or advising them about their entire inventory management across the supply chain. DPD volume happening at JNPT in overall terms for a port approximately ranges from 25% to 28%. In project engineering business, the asset utilization on crane fleet continues to be strong. In terms of progress done in Jhajjar, railways has recently given some direction on the DRFC requirements. Commercial viability of Jhajjar in the first phase could be anywhere around 18 months to 20 months. For land acquisition, title study or title search is complete, subject to getting into future approval from the railways. Net debt risen in this quarter by Rs.60 Cr predominantly because of the capex for the Kolkata CFS, which is under implementation. Net debt has gone up this quarter because term-loan is taken up at a very attractive rates, so it’s not required to lock the equity, which has got a higher cost. Debt market interest rates is very attractive for top rated companies in India, so advantage is being taken of that and extra money is being returning to either shareholder or having a different business fronts, which is earning a higher return than the cost of the debt. Non-controlling interest of Rs.51 Cr is the Ind-AS requirement because the Ind-AS is applicable from current financial year. 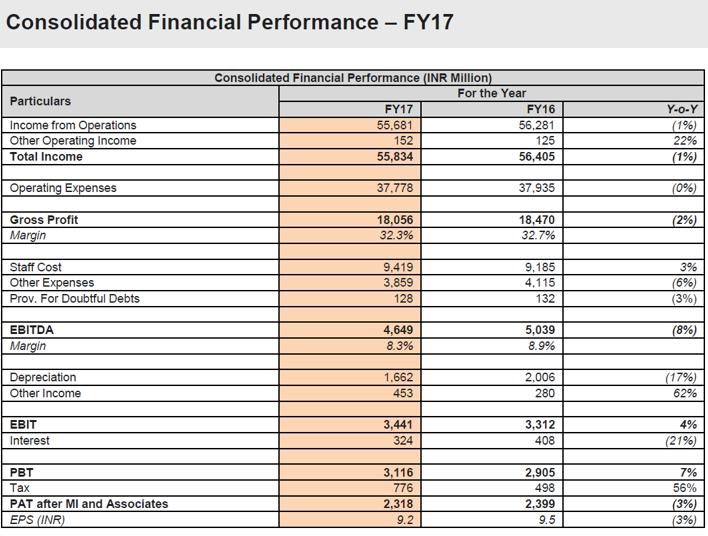 Restate is needed for three year number to have an apple-to-apple comparison as per the Ind-AS requirement that is up for FY2016-2017 and for FY2016 just to have a correct opening numbers of F2015 which has also been restated and these can be taken as pure Ind-AS adjustments. EXIM trade globally has increased up to 2% to 3% and consumption in India has increased up-to 5% to 6% which in turn has led to the increase in growth. 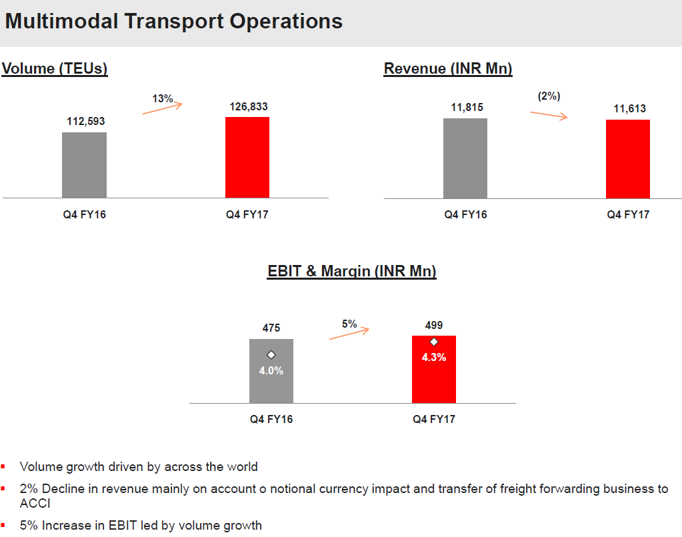 The company is expected to grow the MTO volume by 2% to 3%.